I will admit I have a slight obsession with cookbooks. If you are ever looking for me in a bookstore just go to the cooking section…. I’ll be there. I recently purchased the new cookbook Extra Virgin by the Cooking Channel Stars Gabriele Corcos and his wife actress Debi Mazar. If you haven’t watched their show Extra Virgin, it’s worth making the time for. Gabriele grew up in Tuscany and Debi in Queens, New York and their combination of rustic Northern Italian recipes with classic American Italian recipes is divine. Their cookbook will make your mouth water at the turn of every page. As I was going through their cookbook there was one recipe that really caught my eye the Lemon Brûlée Tart. The next thing I knew I was on my way to the grocery store to by ingredients and a culinary blowtorch. I’ve always wanted a good reason to by a blowtorch. When I was at the grocery store looking at the lemons a ray of heavenly light shined down on the produce, they had Meyer Lemons. Now if you have never had a Meyer lemon I suggest you look for them next time you are at the store. They are delicious fruit that is a cross between a lemon and an orange. Meyer lemons have thin yellow-orange colored skin, but the inside flesh looks like a normal lemon. Once you’ve taste the slightly sweet juice of a Meyer Lemon you will understand why I was jumping for joy in the middle of the produce section. I knew that I had to use these delicious Meyer Lemons in this tart. The recipe for the crust of Lemon Brûlée Tart also called for a shot of Grappa or Rum. I didn’t have either of these, but I did have a bottle of my personal favorite Italian aperitif, Limoncello so I used that in place of the Grappa. Also to get a really good brûlée on the top crust chill the tart prior to serving and blot off any excess moister with a paper towel before adding the sugar to the top to brûlée. The finished tart was heavenly with a delicate, buttery, flaky crust. The custard filling was a bright summery yellow with a velvety texture and a sweet and tangy flavor. But my favorite part of this beautiful tart is the sound the fork makes as you crack through the brûlée crust on top. Life doesn’t get better than that. For the dough: Add the flour, sugar, lemon zest and salt to a stand mixer fitted with a dough hook. Mix together for 30 seconds. Add the vanilla seeds and mix to combine. Add the butter and mix on medium speed (no higher than speed 4), until the mixture looks like coarse crumbs. In a small bowl, beat together the egg yolks and the rum. Add to the mixer, as the machine keeps running on medium speed; the dough will start to form. As soon as it starts to leave the sides of the bowl, turn off the machine. By hand, on a flat surface, work the dough into the shape of a disk and refrigerate for about 1 hour. Preheat the oven to 375 degrees F. Butter an 11-inch tart pan very well. On a floured surface, roll the dough to about 1/4-inch thick and gently lay it into the tart pan. Press the dough lightly into the round edges, then, using your fingers, press on the edges of the pan, cutting off the excess. With a fork, poke the dough several times, all the way through to the pan. Brush the dough with a thin layer of egg white. Bake, with a sheet tray on the rack below it, until the edges of the dough look golden and crisp, 25 to 30 minutes. For the filling: Whisk together the cream, sugar, yolks and eggs in a large bowl. Whisk in lemon juice and zest. Let rest while the tart shell bakes. Remove the crust from oven, place on a sheet tray and pour the filling into the warm shell. Tap gently on the counter to release any excess air bubbles. Bake the tart in the oven for 40 minutes. The custard will appear firm with just a slight jiggle in the center of the tart. Remove from the oven and let cool for about 30 minutes. 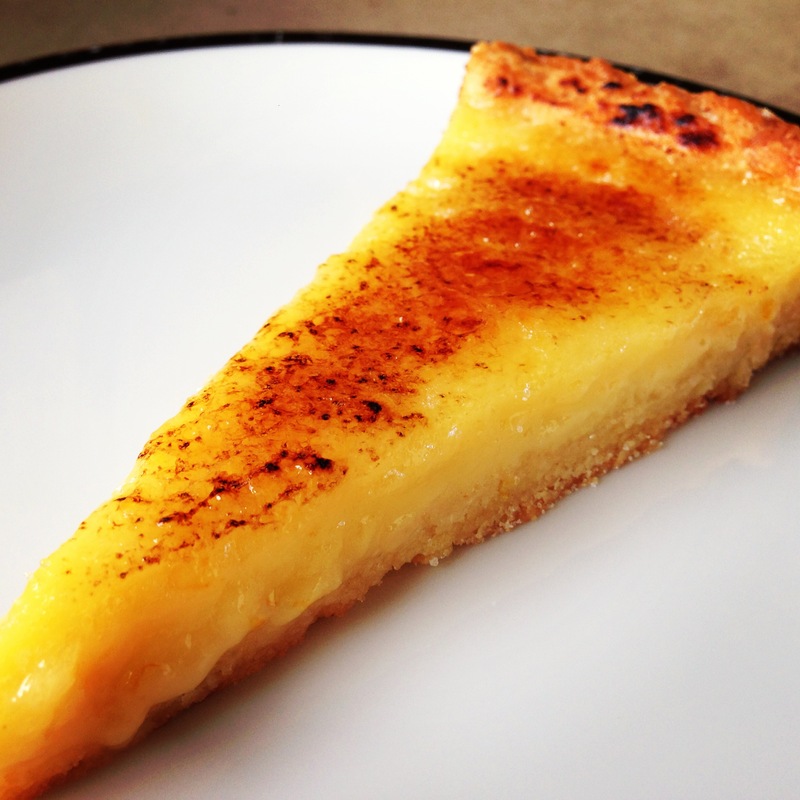 To serve, remove the tart from the pan, sprinkle evenly with granulated sugar and use a torch to caramelize it. Repeat the final step twice to ensure a real crunch!